As a(n amateur) pianist and a lover of music, I am pleased to introduce you to today’s Throwback Thursday book. I think that those interested in art, history, or mechanics will find this an enjoyable read as well. I think most everyone would agree that a musician playing a piano is an artist. They use their hands to coax beautiful, haunting melodies from that large instrument. Some have composed their own music, while others play what has been written for them to enjoy. 88 keys. Strings and hammers. But a Steinway. A Steinway piano is a work of art in itself. I think many people don’t realize this. Steinway continues to make it’s pianos as it has traditionally done for over one hundred years. That is to say, the majority of the process is done by hand. The craftsmen of a Steinway are artists in their own right. Each piano is made in the same traditional way, with the same materials, and yet every piano ends up with a character of it’s own. An auto factory can make several hundred cars in an eight-hour shift. Steinway, which takes nearly a year to finish one piano, can ship ten a day. Piano follows the creation of Steinway No. K0862 from it’s humble beginnings as lumber, to it’s finished beauty as a concert grand. The author blends Steinway company history and piano history into the narrative as we follow K0862 through it’s creation. We learn about the different workers throughout the factory and their individual contributions that go in to making K0862. For me, this book was such an interesting read. I’ve always known how special pianos were, but I had no idea what really was involved in the creation of one. And the history was fascinating. 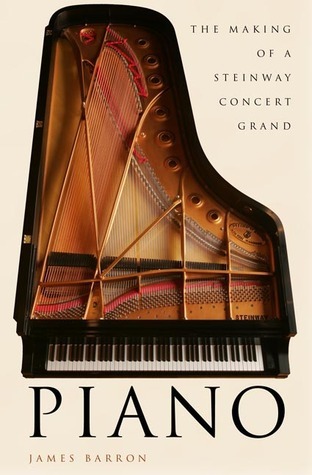 Piano is truly a love story to the Steinway piano, and the craftsman who create it. That’s the fun part, you don’t really need to understand music. It was a great history on the instrument and the company. And each piano truly is a work of art. I think that when taking lessons the teacher can make all the difference. I loved my first teacher, had her a year and then we moved. The new one my mom found – I really did not like her at all. Lessons were miserable. After a few years I was ready to quit, and I did for a summer. Then my mom found my third teacher, and like magic again I loved to play. My boys take lessons now with a teacher they love, and they are really flourishing. I think music is such an important joy in life! Thanks for the link! That was great. I am so out of practice, I need to get back into it. But I am in two handbell choirs, which brings music into my life.